I wrote this new article on Colin Kaepernick, football, and yoga. It will no doubt piss some people off. (That's ok.) Thanks to YogaDork for publishing. So Donald J. Trump is our President-elect. In the week since Trump won the Electoral College, we’ve witnessed an uptick in hate crimes across America. Monday night, Trump appointed Steve Bannon, alt-right head of Breitbart News and a known white supremacist, as chief White House strategist. Former Ku Klux Klan leader David Duke has celebrated Trump’s win as a victory for his white nationalist movement. And swastikas are appearing all over churches, schools, and bathrooms walls across the country. It’s already been hard to talk about the results of the election with our children. Now, with white supremacists at the helm, civil rights are in a bad way. As parents, we’re wondering: where can we look for progressive activist role models for our children? The first thing I’m gonna do is buy my son a Colin Kaepernick jersey. Kaepernick is a stealth yoga teacher. And it’s got nothing to do with his tight pants. Kaepernick first declined to stand for “The Star-Spangled Banner” before the 49ers’ August 26th preseason game against the Green Bay Packers because, as he put it, he couldn’t “show pride in a flag for a country that oppresses black people and people of color.” Kaepernick’s move has sparked outrage across the country, eliciting nationalist critiques, burned jerseys, and even death threats. 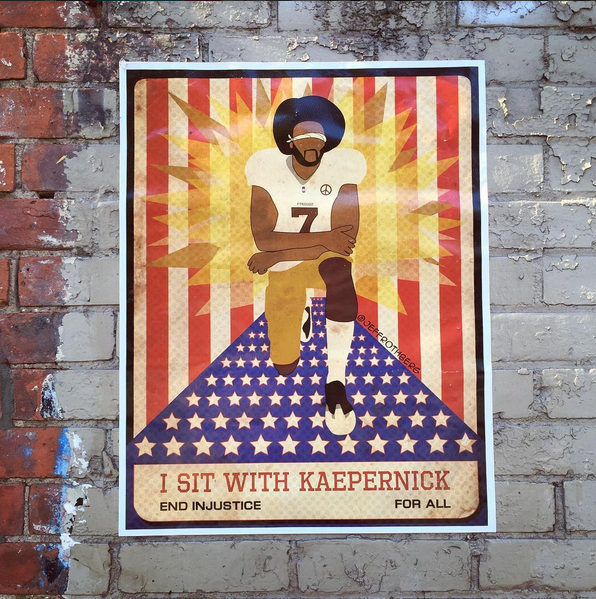 Earlier this month, just prior to the election, Kaepernick quietly launched a Black Panthers-inspired “Know Your Rights” camp empowering black and Latino students in Oakland, CA to combat oppression. A few weeks after Kaepernick kicked off his peaceful protest, I led a yoga philosophy training for current teachers. We covered philosophy basics from old school yoga texts like the Upanishads and the Bhagavad Gita, and revisited the often-murky history of yoga. Then we dragged yoga philosophy into the 21st century, brainstorming about where to find alternative texts—the kind of postmodern yoga teachers that hide out in unexpected places, like Ferdinand The Bull or Fight Club or (gasp) even Donald Trump. One student raised her hand. She brought up Colin Kaepernick. Full article is here. Thanks for reading.